A steep set of log steps make their way up the sandy slope creating an easier route for hikers on the Spirit Sands Trail in Spruce Woods Provincial Park in Manitoba, Canada. 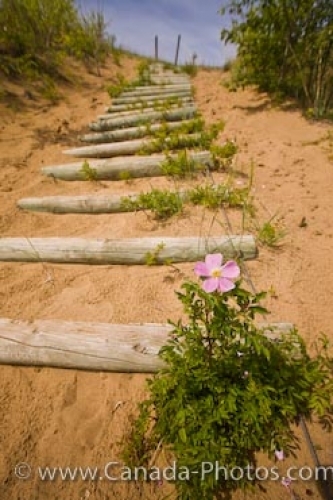 Along the steps, pretty pink flowers blossom in the sun as they prefer the sandy landscape to root themselves. Most of the steepest hiking routes along the Spirit Sands Trail have a set of steps to make the climb a little easier, but visitors are warned not to touch the flowers and natural growth along the trail. Steps and platforms are also another way to protect the fragile vegetation so people do not trample them and destroy the entire ecosystem. Spruce Woods Provincial Park covers an area of approximately 7,460 acres and along the various routes such as the Spirit Sands Trail, visitors will come to understand the importance of the flowers, plants and wildlife as well as the history behind this region. Picture of pink flowers and steps on the Spirit Sands Trail in Spruce Woods Provincial Park, Manitoba. Pretty pink flowers beside log steps along the Spirit Sands Trail, Spruce Woods Provincial Park, Manitoba, Canada.